The banner lowered by Choi and Han. 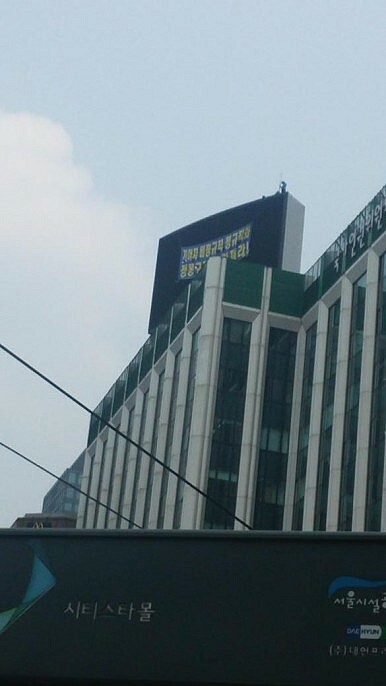 About two weeks ago, two informal workers at Kia Motors, Choi Jeong-myong and Han Kyu-hyop, lowered a moderate sized banner across an electronic display board at the National Human Rights Commission of Korea, a building located next door to Seoul City Hall. The banner exhorted the chairman of the Hyundai-Kia Automotive Group, Chung Mong-koo, to “take responsibility for irregular and regular Kia Motors employees.” Thus began the latest “high-altitude sit-in” (gogong nongseong) against labor market conditions in South Korea in what is becoming a regular symbolic and cultural expression of discontent with the changes made to the Korean labor market over the last few decades. In support of Choi and Han and in solidarity with protests against the spread of irregular work and in-house subcontracting, people involved in a social movement protesting against anti-labor policies and practices held a small festival outside of Seoul City Hall. The movement has branded itself the “Save Jang Geu-rae Movement,” using the name of a popular character from the hit drama, Misaeng. In the television series, Jang Geu-rae, played by actor Yim Si-wan, is hired as a temporary contract worker after a successful internship at a high profile trading company. Despite his impressive work ethic, positive attitude, and stellar work performance, Jang is not hired as a permanent worker after his two-year contract expires. The uncertainty and precariousness epitomized by Jang is seen by many as representative of the changing nature of South Korea’s labor market. South Korea is not unique in this regard. Changes to labor market conditions across the world, and especially in countries traditionally run along a corporatist model (i.e., labor inclusive), are facing a backlash of one kind or another. The new wave of strikes among Germany’s train operators, teachers, and post office workers prompted the prominent German economic sociologist Wolfgang Streeck to write this article for the Guardian. While civil society leaders have stepped in to help mediate and to ensure the safety of Choi and Han, the labor dispute at Kia Motors has yet to be resolved.